Amrita Pritam, or Dirty Harriet? That was one of the thoughts in my mind as I finished watching the powerful new film Soni, now on Netflix after having been on the festival circuit for a few months. Such a juxtaposition – between one of the most elegant Indian authors of the last century and a female version of Clint Eastwood’s cop, snarling “go ahead punk, make my day” – might sound flippant or inappropriate. 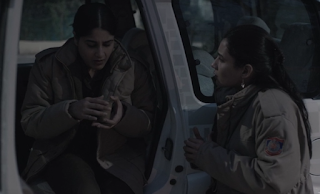 But the titular character in Soni – an often dejected, frustrated junior policewoman – carries versions of both those people within her. 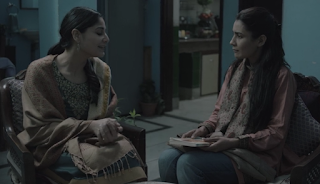 And Ivan Ayr’s film evokes such contrasts anyway: especially for the movie-watcher who is familiar with a very different sort of “angry cop” narrative, yet finds Soni building in its quiet, unobtrusive way towards nothing dramatic like an explosion of violence, but to a reflective moment where its two protagonists talk about Amrita Pritam’s memoir Rasidi Ticket (Revenue Stamp). Soni (Geetika Vidya Ohlyan) asks her boss Kalpana (Saloni Batra) about the book’s unusual title; the latter replies that someone had once patronizingly told Amrita-ji, why write an autobiography: “your life story could be written on the back of a revenue stamp”. This little anecdote comes just before Kalpana beseeches Soni to not resign and Soni replies “Ma’am, mere force mein rehne se kya pharak padega?” Though the point isn’t underlined, the implication is that any life – no matter how small or unremarkable it looks from a distance – can be full of meaning and resonance. Soni, like Amrita Pritam, can make a big difference in her field, whether she is investigating cases or operating telephones. But is it possible for her to be a Dirty Harry as well, or a Singham, even on a minor scale? I don’t want to over-stress the tonal difference between Soni and the more mainstream vigilante-cop film, because these are two disparate modes of filmmaking. One is the mythical, larger-than-life mode that uses escapism as therapy, centres around the figure of the two-fisted cop that goes back at least to the 1973 Zanjeer, and includes some of today's masala films like Simmba or Dabangg (the very look of those titles, with the double letters, suggesting a bulked-up machismo). On the other hand, there are the more grounded portraits of a policeman's life, on a canvas that might include an Ardh Satya (1983) as well as Devashish Makhija’s wonderful short film Taandav (2016), in which a cop played by Manoj Bajpayee gives vent to his feelings by performing a delirious, Nataraj-like dance. But there's something else about Soni, something that goes beyond the Escapist Cop Film-Realistic Cop Film dichotomy. It has to do with gender roles and perceptions, with the subject of women occupying a space that is still seen as largely male, and sometimes requiring the aggressive, confrontational behaviour that is again perceived as being a male domain. A question this film raises is: what if a woman cop loses her temper, or needs to use violence or profanity as a way of taking charge of an outrageous situation? What if a woman gives a ma-behen ki gaali to the man who is behaving fresh with her? What will the response be then, both from her antagonist (who might feel more entitled to express his anger) as well as from her team, who might be inclined to view her not just as a loose cannon but, more problematically, as a woman who is a loose cannon. Instead of providing easy answers, Soni gives us a few vignettes from the lives of Soni and Kalpana – two women negotiating their different positions and hierarchies. Soni, being the subordinate and from a lower-class background, is the obvious underdog, and her personal frustrations often spill over into her work life: she burns with righteous anger, sometimes goes too far in dealing with transgressors or bullies, and has to be hauled up by her boss. However, the relatively privileged Kalpana has her constraints and problems too. Pressure to start a family, to not work the night shift. She is married to a senior cop, and one senses a tension beneath the geniality of their exchanges – a tension that may stem partly from the fact that she is clearly subservient to him in more than one sense, and has to let him pull strings for her at times. In what at first seems like a bit of indulgent playfulness in the script, but later starts to make organic sense, she is frequently addressed as “Sir” by her male subordinates – perhaps the implication is that what they respect is the "manliness" of her status and designation rather than her own worth as a person. 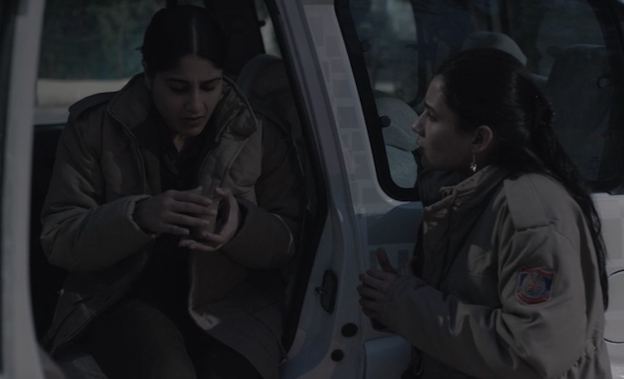 The film expresses all this through the extraordinary, lived-in performances of Ohlyan and Batra, the use of lengthy, handheld-camera takes that capture the daily grind of their lives, and through the sound design: from the persistent hum of disheartening news coming through the radio to the noises of the city – metro construction, men boasting about their conquests – that explode in Soni’s ears as she tries to get a grip on her life. Nervy confrontations alternate with moments of grace and empathy between the two women. 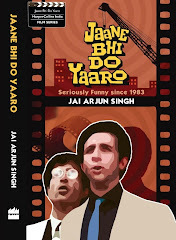 It is telling, too, that near the end the explosive statement “Dil kar raha tha goli se maar doon sab ko” is said, in a quiet tone, not by a policewoman working constantly under pressure but by a 13-year-old girl who has been subjected to a humiliating prank by her (presumably male) classmates. This violent sentiment, expressed in a soft voice, echoes through the story in one form or another. It moves beneath the film’s subdued surface, so that you’re always waiting for the explosion, for the gun to go off – and it’s all the more effective when it doesn’t happen. Interestingly, one of the producers of Soni is listed at Jabberwockee Talkies!